Home » Events » What I did this week. I didnt have just a single theme to write about today, but a bit like my week, this post is going to be about lots of little things that all together make up ..well… a week! I won’t be taking my wheel for this event, as there will be someone there with a wheel already who spins local sheep wool, and its not a huge space. I will have my spindle, and some wool combs, so anyone interested will get a look at how I prepare fleece for worsted spinning, and actually I am planning on using the opportunity to prep some lovely alpaca fleece from Marian of Alpaca Milestones here in Holland. I have already dyed it pale leaf green, and am going to blend in a little trilobal nylon sparkle then spin two fine smooth singles that will be plied together, along with… and here I am stuck, either silver or gold thread. This is going to be one of the yarns in my Lord of the Rings / Hobbit collection, Lothlorien, the magical elven forest visited in both the Hobbit and LOTR. In my mind, Lothlorien is golden, glowing, with dappled light and soft greens. But I also have the Elves themselves in my head as cool, silvery creatures. See why I am stuck? 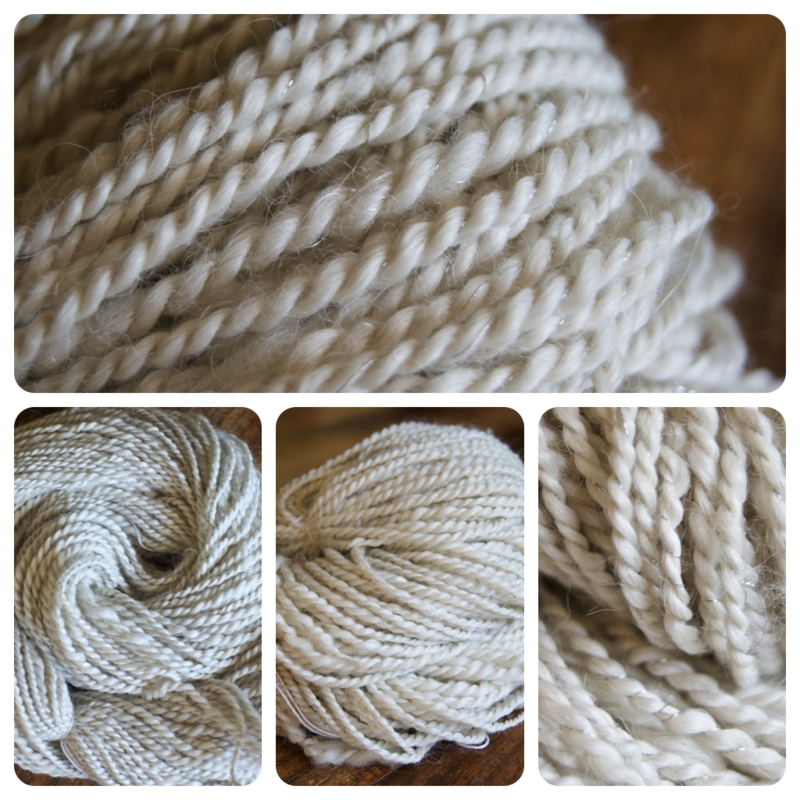 What you think I should do – gold or silver for this yarn?? What I do know, from the previous pure white and silver yarn I spun with that alpaca, is it feels like the most luxurious yarn ever, with an incredible weight and drape. Alpaca has certainly become my current favourite fiber! It can be tricky to comb as its so fine and doesnt have the hooks of wool and tends to slip past itself in a less than handy way when combing, but I tried out a few things for the white yarn and was really happy with the result from the combing. What else was I going to tell you?! Spinning, Open Day.. oh yes! The Spin Artiste Leather and Lace Secret Stash project!! This is really awesome, and I am getting more and more excited about getting my Stash so I can start making the Leather and Lace yarn 🙂 This is a wonderful project organised by Arlene of Spin Artiste, and Debra Lambert of Picasso’s Moon Yarn Shop in the US. Part of my excitement about this project is that this one is by invitation, and I feel incredibly honoured indeed to be among those invited, and also quite daunted as names like Lexi Boeger, Ashley Martineau, Christiane Knight, Esther Rodgers, Nicole Constantin.. well the list goes on and the names are ALL the names of my most admired yarn heroes! What a feeling to be in this list, mega exciting, and I hope like hell I can come up with something worthy of being among them! And when the yarns are done? We all send the finished yarn to Arlene and the entire collection goes on tour 🙂 It will travel the East Coast of the US, Yarn shop to yarn shop, and the journey will culminate in an exhibit at the SWAY Guild Art yarn Festival in April next year, where it will also be auctioned as a complete collection! I know some people have already received their Stashes, so I hope mine arrives soon! The idea I have for this yarn could be somewhat time consuming (but I think it will be really worth it) and there is a deadline to get it there by, and I am itching to get started. Keep your fingers crossed for me that it arrives real soon! Hmm. so.. more news from the week? I was sure there was something else 😛 Oh yes! There is a local event coming up, the ‘Dag van de Wol’ – which I guess translates to something like; Wool Day! Its an annual event here, and will be full of wonderful fibers, yarns, felting and spinning workshops, I am really looking forward to this day as Alet of Textielwerk Wol en Zo (our delightful host for the recent JazzTurtle Workshop weekend) has suggested I might like to join her giving the dyeing workshops that she is offering on the day! She uses the Landscapes dyes, which have a beautiful range of gorgeous colours, I can think of quite a few fun things to do with those of course! In the long term, I would like to develop my own dye workshops to offer here for anyone interested, I have started with the planning, and the theme will be ‘Finding your Inner Colour Hero’ 😀 If you are in or around the Netherlands and interested in taking a dyeing class then be sure to Register on my site here to also get my newsletters, as I will be sending out information once something concrete is organised! your wools are luscious! Dang! I saw your blog address on willowing and wanted to pop over and say hi! Hi!. I can imagine all sorts of things made from them! 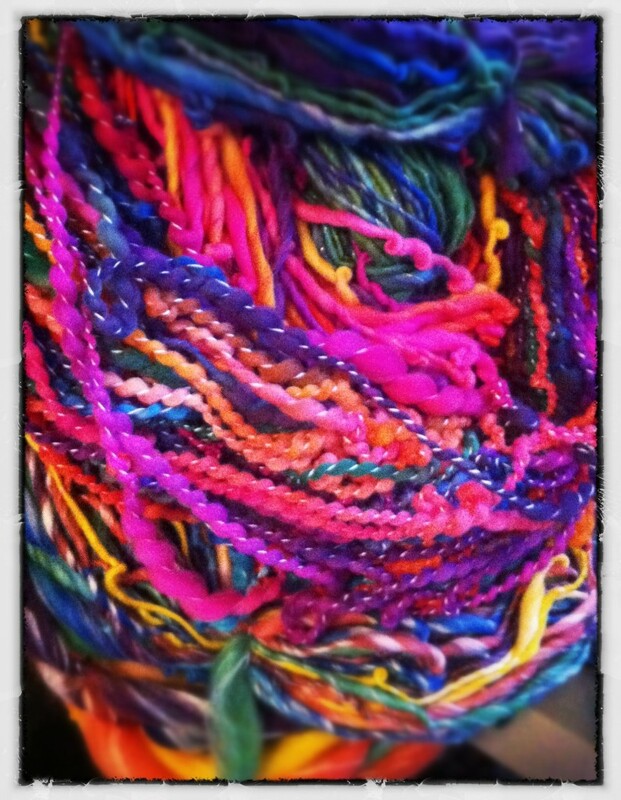 The colors of your hand-dyed yarn are just lush!! I,too, vote for gold as well as silver. Concerning the Leather and Lace spinning–I have had for probably over 20 years some Mokuba Japanese Knitting Tape, several spools. It is forest green patent leather on one side and red faux suede on the other, about 1/8 to 1/4″ wide. I don’t know if it’s soft enough to spin but perhaps I should try. Never knew what to do with it but couldn’t pass it up!! Any ideas? Yay Elaine youre here! 🙂 And it looks like I need to prep a lot more Alpaca fiber! I am hand combing it so it takes a bit longer than carding, but so worth the effort 🙂 That tape sounds pretty amazing! The red and green are quite strong colours together, and interesting textures, with patent and suede together, I am sure you could do something cool with that! How wide is it? Maybe you can spin it in a way that it alternates sides or something, wrapped round a core? I’m guesing it’s about 1/4″ wide and if it’s knitted it switches sides anyway. I’ll just have to fiddle with it!! Oh, that all sounds so great ! Where is the dag van de wol held? I can understand you being torn about the silveror gold thread! I probably won’t be helping when I say, spin some of each! I want to see both! 😀 haha! And probably want to HAVE both!